In the Age of Trump, there are still some decent Republicans. The Republican Party in Philadelphia has been on a downward trajectory. In the past, we had successful moderate or liberal Republicans—e.g., Arlen Specter, Thatcher Longstreth, Sam Katz, and former State Senator Phil Price. Many longtime Democrats voted for these candidates. In recent years, however, the number of moderate Republicans has dwindled, as has the number of Democrats willing to split their ticket and vote for a Republican in a general election. Ninth Ward Republican Party ward leader Christopher Lins and Ninth Ward Republican committeeperson Jane Toczek acknowledge the challenges. Chestnut Hill resident Christopher Lins, the Director for Attorney Recruitment at JURISolutions, has been active in the Republican Party since 2008. He was appointed ward leader in 2014 and elected ward leader in 2018. Mt. Airy resident Jane Toczek, a long-time employee of Chestnut Hill’s Philadelphia Print Shop and long-time board member of Stagecrafters, has served as committeeperson since 1996. She has a long family history with the Republican Party. Her parents met at meetings of the Young Republicans, and her father, Charles Mebus, served as a Republican state representative in Montgomery County from 1965 to 1979. Despite her living in the Ninth Ward’s overwhelmingly Democratic 1st division, Toczek’s Republican affiliation has not been a problem. “My neighbors know I’m a Republican, but not a Trump supporter,” she said. 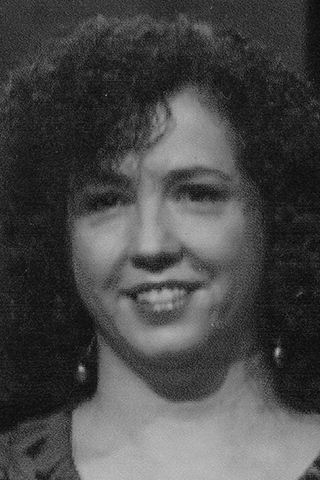 According to Toczek, “there were a lot of moderate Republicans” when she was growing up. She is clearly not happy about the transformation of her party. Lins noted that there are still some moderate Republicans around, such as City Commissioner Al Schmidt and Beth Grossman, a candidate for District Attorney in 2017 whom Lins considered significantly better qualified than winner Larry Krasner. Both Lins and Toczek think it’s important to have a Republican Party in Philadelphia as a check against corruption. Although no Republican with the exception of Schmidt has won city-wide office in recent years, the City Charter provides the Republican and other minority parties the opportunity to fill that watchdog function. Seven City Councilpersons-at-large are elected. The Charter requires that two of these seven must be the two most successful candidates representing non-majority parties. The five Democratic candidates who win the primary election for at-large seats are all but guaranteed victory in the general election. Lins encourages Democrats to cast two of their five votes for council-at-large seats for the two best-qualified Republicans. Lins further notes that both parties have failed to engage voters and that in the last presidential election, Republican turnout was 57%, with Democratic turnout only slightly better. Given the highly educated, informed voters in the Ninth Ward, he thinks that Ninth Ward turnout should be significantly higher. Lins and Toczek see the major divide between the Republican and Democratic parties as over the role of government. They would like to see a greater role for private non-profit agencies in addressing social welfare issues. Of course, the resources the non-profit sector can marshal are insignificant compared to the resources of the United States government. Lins contends: “No responsible Republican is calling for the dismantling of government.” He would like to see a civil conversation about how best to utilize government resources, but is pessimistic about that occurring in today’s toxic political culture. “It’s not partisan. It’s just helping your neighbor,” he said. Chris Rabb has a similar philosophy about bi-partisan cooperation on the local level. The increasing tendency of voters to register as independents suggests there is trouble ahead for the major parties. Responding to a question about whether the Republican Party will survive the Trump administration, or even whether the two-party system will survive, Lins was of the opinion that the two-party system will endure, as all our laws and institutions have been set up to support it. However, he speculated that the current configuration of Democratic and Republican parties may not last—they might be replaced by two very different parties. The dissatisfaction of a younger generation of progressives with the Democratic Party, as well as the dissatisfaction of socially liberal but economically conservative voters with the Republican Party, may be harbingers of future political realignment. Both Lins and Toczek see a dysfunctional political system in which, as Toczek put it, “compromise is a dirty word,” and incivility reigns. According to Lins, “no healthy political system could have elected Trump”; however, he sees the political dysfunction as preceding Trump and resulting from a weakening trust in institutions. However, despite their dissatisfaction with the national picture, they both see the Ninth Ward Republican Party as on the right track and believe it operates according to principles of democracy and transparency. But the reputation of the national party is a heavy burden for local Republican activists. Will the party Jane Toczek grew up with ever return? Perhaps not before there’s a change at the top. Modern Times: American Art 1910–1950 at the Philadelphia Museum of Art for one more week! 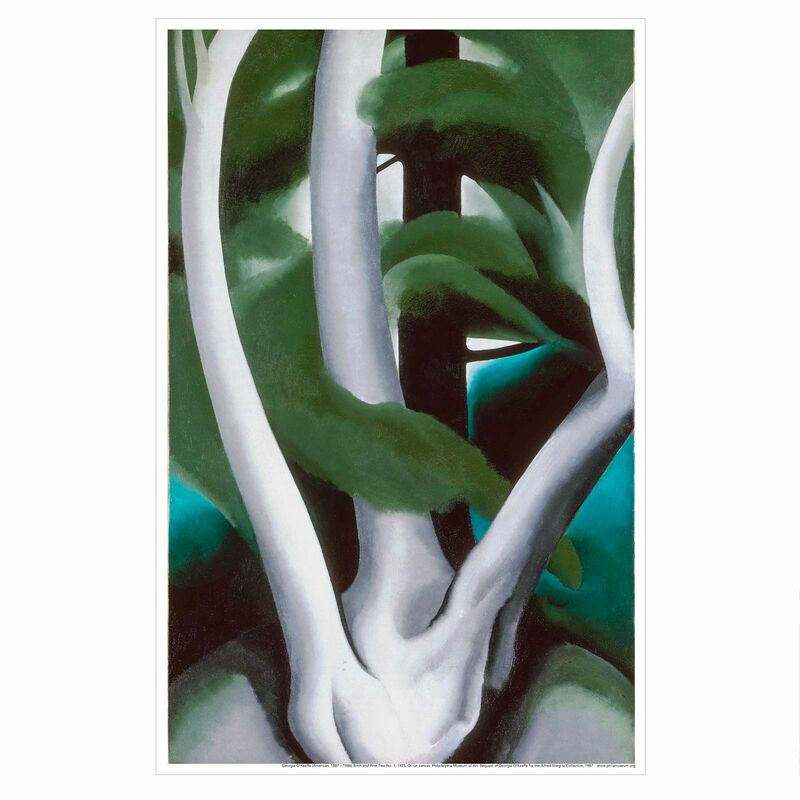 Before we retired, my husband Rick and I could never get it together to attend an exhibit at the Philadelphia Museum of Art until the very last day. We were contending with huge crowds of procrastinators and we vowed that when we retired, we would make sure this didn’t happen. Unfortunately, we didn’t kick the bad habit in retirement, but we are improving and managed to get to Modern Times: American Art 1910–1950 a week before closing—something of a record for us. Work, technology, the economy, architecture, world affairs, leisure activities—all were transformed in the first half of the twentieth century. 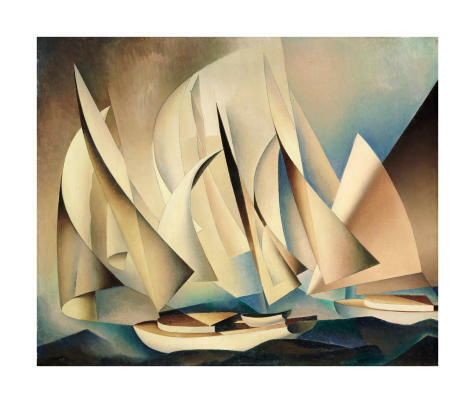 Artists of the Modern movement looked at the changing world around them and tried to capture the newness of these experiences through both the style and the subjects of their work. 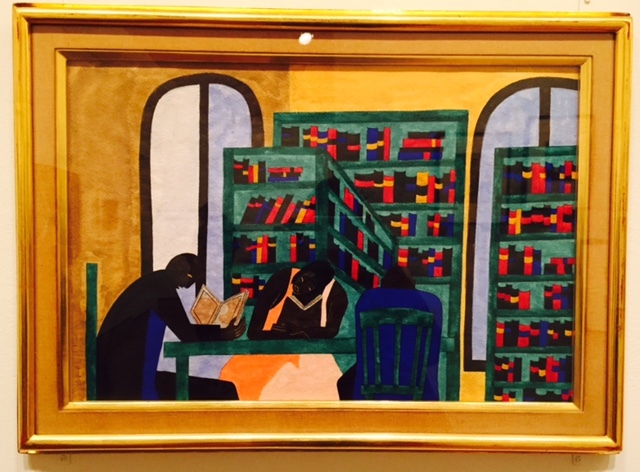 Another favorite, a compelling image that told a powerful story, is The Libraries Are Appreciated by Jacob Lawrence, part of his Harlem series, No. 28 now exhibited at The Harlem Branch Library of the New York Public Library. The libraries were especially appreciated by African-Americans who had migrated from the South where libraries either did not exist or were segregated. As someone whose life would have been very different if not for the Philadelphia Free Library where I spent my childhood, this photo really resonated with me. In retirement I have once again become a heavy user of the Free Library. 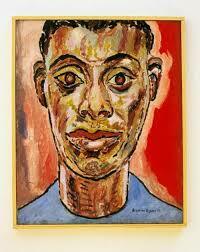 African-American artists are well-represented in the exhibit. 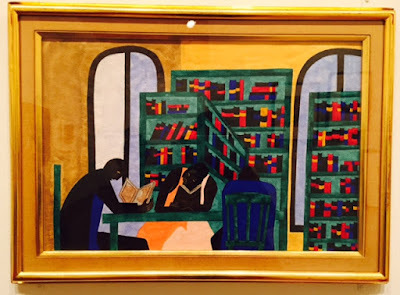 In addition to Jacob Lawrence, there are paintings by Horace Pippin, Claude Clark and Beaufort Delaney, including Delaney's iconic portrait of James Baldwin. This exhibit is not to be missed! "Mt. Airy author’s new book is about anonymous sensation"
It is entirely possible that you have never heard of Elena Ferrante, but millions of fans cannot get enough of her. Ferrante is the most important literary sensation to have emerged from Italy in decades. Her quartet of Neapolitan novels has sold more than 5.5 million copies worldwide. 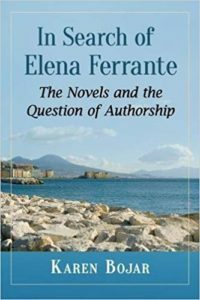 The author has always maintained that the name Elena Ferrante is a pseudonym, and there has been intense speculation in the literary world as to the author’s real identity and even whether or not it is really a woman. The New York Times has written that enthusiasm for the novels is so intense that it is being described in “epidemiological terms, making the phenomenon sound almost like an infectious disease.” And Ferrante fever is likely to heat up even more in the coming months since an Italian/American television adaptation of her first book, “My Brilliant Friend,” is under way. The ultimate aim is to adapt all four Neapolitan novels over 32 episodes. The HBO series is scheduled for sometime this fall, but no specific date has been set. Ferrante’s most passionate Philadelphia admirer has to be Mt. Airy author Karen Bojar, whose book, “In Search of Elena Ferrante,” was released by McFarland Publishers on July 3. “I wrote this book,” Bojar told us in an interview last week, “to help me unlock the secrets of Elena Ferrante’s power, to better understand why these books have had such a hold on my imagination and that of millions of readers worldwide.